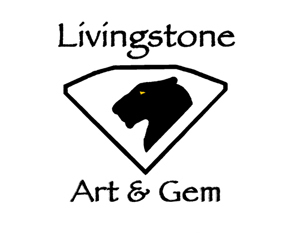 Livingstone Art & Gem was started in June 1991. Prior to that, we had an amazing experience which made it possible to become dealers. It happened while vacationing that my brother-in-law, Lynn Salyer said, "We know a little old lady in our church who has rocks in her basement. Would you like to go see them?" We, of course, replied, "Sure, we'll go see the little old lady with rocks in her basement!" We had no grasp of what a life changing experience that would be. We descended the stairs and found a shelving unit the full length of the basement filled with antique cigar boxes from the floor to the ceiling containing, for the most part, slabbed gem materials. Sweet little old Marguerite Follett had been guarding her husband's treasure since he passed away. That night, of the five adults in that room I was the only one who had been studying gems so, while I was avidly searching through this trove, people were bringing me pieces to look at. I had to keep reminding myself to breathe. What we were seeing was astonishing even for people accustomed to lapidary. Margarette's husband Vere had been collecting since 1935 and he seemed to have a knack for obtaining what was destined to become rare classics. We had not the slightest hope we would ever be able to own it all but when Marguerite passed away her son, knowing our interest, made it available to us. Thanks to my father we were able to buy it all. We have been cutting and creating treasure since then. 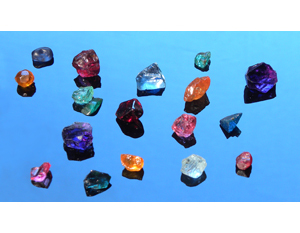 We have been very fortunate in obtaining fine gem materials by collecting collections. We also have some excellent suppliers for cool rocks. With 273 varieties of gem slabs and 143 varieties of rough rock, we can usually show collectors things they've never seen before. We specialize in the unusual, and we love to share our love of gemstones and art with the world! This site is a work in progress, so if you don't find what you're looking for, please feel free to contact us, and we may be able to help you out! 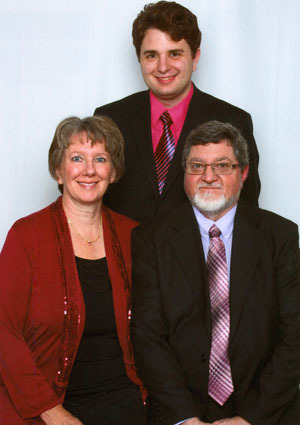 Livingstone Art & Gem consists of Allan, Jan, and Ben Livingstone (husband, wife, and son respectively). We are based in Cold Lake, Alberta, Canada. Allan Livingstone studied in the Alberta College of Art (now the Alberta College of Art and Design) from 1973 to 1976. He has been painting for thirty-seven years, and has taught painting for ten years. His roots are in Dutch painting and Impressionism, and he has traveled in Europe in pursuit of these interests. He was Craftsman of the Month in Rock and Gem magazine for November, 2007. The award was for a Leopardskin Jasper carving of a leopard. He has also faceted Citrine for an international faceting project commemorating the Queen's golden jubilee. These stones are now held in the Smithsonian Institute. Jan Livingstone does the books for the company, has a special gift for organization, and handles any beading projects. Ben Livingstone has worked in the business since his High School graduation in 2007. So far, he has been commissioned for portraiture, as well as a large mural. Ben has completed courses with the Gemological Institute of America. With this training, he will be able to better ascertain the identities of gemstones. Ben's newest role in the business is maintaining the website. Our shop is located: Near Cold Lake, Alberta. Our rural address is 42127B TWP RD 624. Before you reach Cold Lake South on Highway 28 coming from the South, you will pass Tropicana New & Used on your right, and the next road you come to will be TWP RD 624. If you pass the giant sailboats, you have gone too far. Turn right at our sign, and in a short while you will see the cedar sign in our driveway on the right (see top of page).